Oxford, Mississippi — Got the rockin' pneumonia and the boogie woogie flu? Or perhaps a hole in your soul? Well, a new Mississippi-made blues release aims to cure it. The Blues Doctors are in. 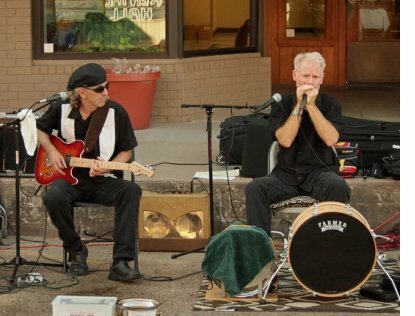 Leading up to their performance at Clarksdale, Mississippi's Juke Joint Festival, the Oxford-based blues duo of Adam Gussow and Alan Gross has released its debut CD as The Blues Doctors. "We're really looking forward to this year's Juke Joint Festival," said Gussow. "A lot of the tracks on our new album are things we beat into shape on the streets of Oxford, so a big street festival in Clarksdale should feel just like home." 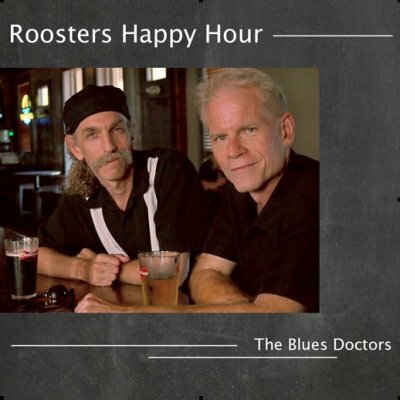 Named for the steady Friday gig at Rooster’s Blues House in Oxford, Mississippi, where Gussow and Gross hammered our their dynamic two-man sound, Roosters Happy Hour aims to please traditional and adventurous blues fans alike. Gussow describes The Blues Doctors as "a power blues trio without the bass." The third leg of the duo is actually Gussow’s thumping kick drum. The result is a hard-swinging jump combo distilled to the bare essentials, propelled by Gross’s jangling guitar and Gussow’s over-the-top harp lines. "Alan and I had crossed paths on the Ole Miss campus for ten years, but we didn't actually hook up musically until the summer of 2012," recalled Gussow. "I needed a local guitar-man to go along with my one-man band thing, and he needed a new challenge. That's how the Blues Doctors were born." Describing Roosters Happy Hour — a mix of new originals and classic covers — as "down-home blues with a big-city angle of attack," the duo is always ready to take the show on the road. They headline Juke Joint Festival's Sunflower Avenue Gazebo Stage on Saturday, April 12th at 5pm. For those who can't make The Blues Doctors upcoming festival show, the new album is available as a download or CD at www.thebluesdoctors.net. The album is also available via iTunes, Amazon and CDbaby. Adam Gussow needs little introduction to blues harmonica fans. Founder of ModernBluesHarmonica.com, organizer of the Hill Country Harmonica festival, Gussow is best known for his twenty-five year partnership with Mississippi-born guitarist and one-man-band Sterling "Mr. Satan" Magee as the duo Satan and Adam. 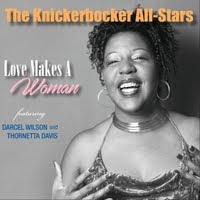 Their releases include the W. C. Handy-nominated Harlem Blues (1991), Mother Mojo (1993), Living on the River (1996), and Back in the Game (2011). 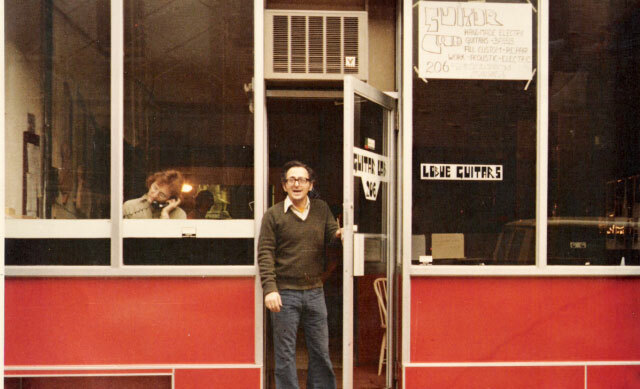 A longtime member of the New York City blues scene before relocating to Mississippi in 2002, Gussow has performed and recorded with many guitar-men, including Wild Jimmy Spruill, Larry Johnson, Charlie Hilbert, Robert Ross, Andrew "Shine" Turner, Bill Sims, Jr., Irving Louis Lattin, and Brian Kramer. 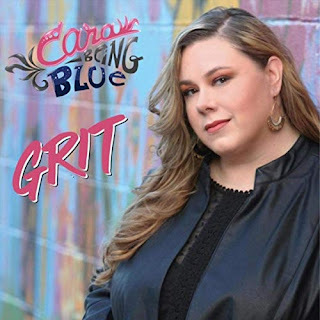 Gussow's debut solo album, Kick and Stomp (2010), rose to the #2 position in the "picks to click" category on Bluesville (SiriusXM), America's premier satellite radio blues show. His second solo album, Southbound (2011), spent March and April 2012 at the #1 position on the Mississippi Roots Radio Airplay Chart. An associate professor of English and Southern Studies at the University of Mississippi, Gussow has written three award-winning books about the blues, including Mister Satan's Apprentice (1998), a memoir about his time as a Harlem street musician. Alan Gross is perhaps best-known for his long association with Mississippi bluesman Terry "Harmonica" Bean — he's played guitar in his band for a decade — and work with hill country performers Kenny Kimbrough, Lightnin' Malcolm and Eric Deaton. He's also gigged with R. L. Boyce, a mainstay of Otha Turner's Rising Star Fife and Drum ensemble, and played numerous festivals across the state of Mississippi. A professor of clinical psychology at the University of Mississippi for almost thirty years, his guitar influences include Muddy Waters, Duke Robillard, Jimmie Vaughan, and Warren Haynes.